Tuulikki and Emma discovered the music of Orsa independently: Emma as an 11-year-old at a fiddle course in Malung, and Tuulikki via a crackling archive recording at the Royal College of Music in Stockholm. They share a deep passion for the music inherited after the Orsa fiddler Gössa Anders Andersson (1878-1963). Together they have plunged into the depths of his fiddle style and tonal language, listened to archive recordings and then developed their own interpretations of his music. They want to find a way back to Gössa Anders’ ancient style of playing – the complex rhythms, the truculent swing, the phrasing, articulation, ornaments…the list is long. Tuulikki faces challenges like imitating the crisp accent of the bow with bellows and fingers, and adapting microtones to her chromatic instrument. The arrangements are most often based on a modal thinking, with inspiration taken from Gössa Anders’ two foremost playing partners, his daughter Gössa Anna Andersson (1906-1999) and Jämt Olof Ersson (1872-1938). 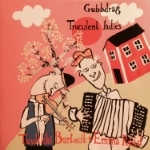 "One of the best folk music albums this spring"
"Emma on fiddle and Tuulikki on free-bass accordion bring new dimensions to the heritage after the fiddlers Gössa Anders Andersson, Bleckå Anders Olsson and Pål Karl." "If the Harbron/Reid album whets your appetite for traditional Swedish music, then this album will provide a veritable feast. Largely influenced by the Orsa fiddler Gössa Anders Andersson (1878-1963) the free-bass accordionist and fiddler deliver an intriguing array of tunes not familiar to our ear. The modal scales, the microtones, some unusual rhythms all make for a CD ideal for those wishing to extend their own repertoire into a challenging style – or just lie back and conjure up images of Scandinavia!"